I love learning about useful life hacks, and here’s a simple one that has helped me to de-stress and live more mindfully at work. It’s a little strategy called Pomodoro and it has changed the way I tackle my endless To-Do list – for my health. If you spend most of your work life at a desk, and in front of a computer, it can be challenging to find moments to move more, to stretch, or to rest your eyes throughout the day. And if you are anything like me, it is too easy to become immersed for hours without looking away from the screen. Over the years, there have been plenty of days filled with sore muscles, tense shoulders, and anxiety that only lessen slightly over the weekend. While some physical tension and stress naturally come with responsibilities, approaching deadlines, and long To-Do lists, an overwhelming amount with no outlet is problematic. This past summer, I came across the Pomodoro Technique, a strategy that many are using to increase productivity at work. But it’s so much more than a productivity tool. It’s also a daily reminder to breathe, move, and rest. The traditional Pomodoro Technique uses a timer that breaks down work into intervals of 25 minutes, followed by a 5-minute break. The technique comes from studies showing that deep work punctuated by short but frequent breaks can improve mental agility. It has since been adapted, and many Pomodoro timers now allow you to customize your work and break intervals. On a typical day, I set the timer for one hour, followed by a 5-minute break. I find that this encourages me to complete tasks during that hour and then offers me a chance to rest before moving onto the next task. Walk a lap or two around the office. Do a few deep breathing exercises. Lean back and close your eyes. Listen to a relaxing song. Make a cup of coffee or tea. Enjoy a beverage while catching some natural light by the nearest window. Have a quick chat with a coworker about something non-work related. If you search for Pomodoro Timer, you will find many variations – desktop timers, simple timer apps, and more involved apps that sync your To-Do lists with a customizable timer. This means that you can find the tool that works best for your schedule and needs. You might find it easier to simply set repeated timers on your phone’s built-in alarm. Or you might be like me, someone who depends on organized To-Do lists, and would like an app with more bells and whistles. 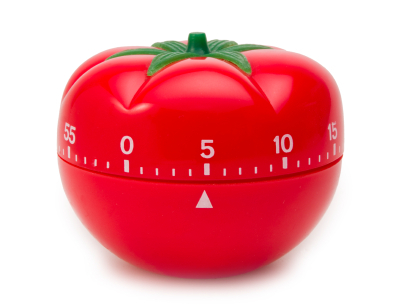 The Pomodoro timer is not perfect. The technique is not possible for every type of employment. On days when I’m struggling to meet a deadline or when I don’t want to disrupt my momentum, I tend to skip my breaks. However, I never leave the app off for too long. If you can, give this little timer a try! My mind and body (and my To-Do list) have been thanking me for giving it a go.